Is this impressive-looking Canon the best enthusiast DSLR out there? Canon has created an excellent camera that makes a worthwhile upgrade from the 70D. It’s well-built with sensibly arranged controls, has good ergonomics and an extensive feature set, and can be set up to suit your shooting style. Most importantly, the image quality is superb with lots of detail. 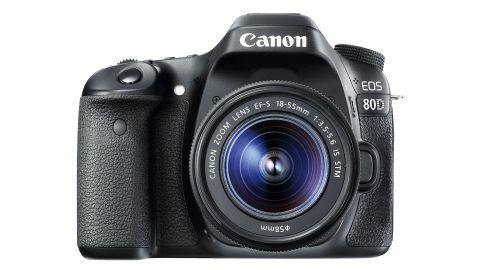 UPDATED: The EOS 80D from Canon is intended for dedicated enthusiast photographers, a demanding group of people who want to be able to shoot a huge range of subjects in a variety of conditions. The camera features a 24-million-pixel sensor along with a DIGIC 6 processing engine; a combination that brings a native sensitivity range of ISO 100-16,000 – a full one-stop higher than the 70D – which you can expand to ISO 25,600 (the same as the 70D). Even though the EOS 80D was launched back in 2016, it's still arguably the best Canon camera for enthusiasts and anyone upgrading from a cheaper model. The maximum continuous shooting rate is the same as the 70D’s at 7fps, but the burst depth has been increased to 110 JPEGs or 25 raw files when a UHS-1 SD card is used. That’s a significant step up from the 65 JPEG or 16 raw files possible with the 70D. Modern DSLRs have two autofocus systems: one for when using the camera conventionally (in reflex mode), where images are composed in the viewfinder; and a second for use in Live View and video mode. Canon has improved both of these systems for the 80D in comparison with the 70D. The reflex mode system, for instance, has 45 AF points, all of which are cross-type, whereas the 70D has 19 points. It can also use colour information from the 7,560-pixel RGB+IR (infrared) metering sensor to help with subject tracking. This and the increased burst depth makes the 80D more attractive to keen sport and action photographers. Turning to the Live View and video autofocus system, the 80D uses Dual Pixel CMOS AF technology like the 70D, which means it has phase detection points on the imaging sensor itself. The new system is more sensitive and faster than the one in the 70D, but because fast autofocusing often isn’t desirable when you’re shooting video, it’s possible to vary the speed of the 80D’s system over seven steps for slower focus changes.